Took some time late this afternoon to go birding with my wife. It was a great afternoon driving around slowly on the back roads, often on the wrong side of the road, without seat belts just hoping to catch a glimpse of some bird we may have never seen before. We saw a lot of birds today. We saw a Red Tail Hawk. We saw a Great Blue Heron (with a damaged wing). We saw Red-Winged Blackbirds. Canada Geese. Ducks. Cardinals. And a few others whose names I simply do not know at this moment. I so enjoy just driving around and watching for birds and other animals to appear. Sometimes we see birds. Sometimes we see deer. 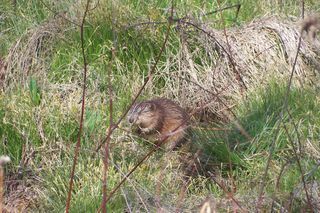 Sometimes we see whatever that is to the left (beaver? groundhog?) Sometimes we see turtles. We see them in the grass and in the sky and in the water. We see them in trees or walking across the road like they own the place. Birds sit in branches or on wires or fences. There is life all around and it is so much fun to look for it and find it. So we were driving along a back road and we happened to see some ducks swimming around in some water that was running along the road but about 15-20 feet below us. My wife saw the ducks with their young and said I should stop. Well her camera's batteries had died so I decided to get out with my phone and snap a couple pictures. When I got out, however, I inadvertently closed my car door too hard and it startled the ducks; they flew off quickly. What was amazing about this episode was something else though. As I stood watching our prizes fly off to safety something caught my eye and I turned thinking maybe it was other birds flying off too. No. Not so much. Turns out it was about 15 deer that had also been right beside the water having a drink or grazing or sleeping–I don't know because I didn't see them until they started bounding off through the tall grass and out of sight. I suppose there are two lessons that can be learned from this. First, when birding, it is best to walk. It is best practice not to talk. It is best practice not to slam car doors. This was a rookie mistake even though we've been birding many times. The second, perhaps more important, lesson is that there is so much that we simply do not see. If I hadn't slammed my car door I never would have seen the deer. I would have only focused on the ducks. Well my point is that maybe sometimes when we make mistakes it serves a greater purpose of opening our eyes to see something that we otherwise would not have seen. Perhaps we get so focused on seeing what we want that we overlook or ignore our surroundings. Then the door slams, and there are the deer.